I recently led a cycling tour for high school girls with very mixed biking abilities. Their giggles and "whoops" as we flew across Portland's Tilikum Bridge are why I do this work. I am thrilled to be part of the Alta team and help communities create safe, inspiring, whoop-worthy infrastructure! 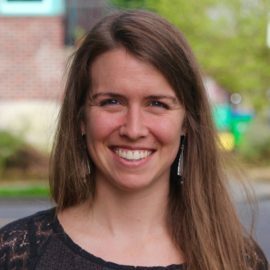 Katie is enthusiastic about collaborating with communities to create active, equitable places. She brings expertise in community engagement, long range transportation planning, graphic design, and mapping. Katie graduated from Colby College in Maine with a BA in Government and Global Studies and recently earned a Masters in Urban and Regional Planning from Portland State University.